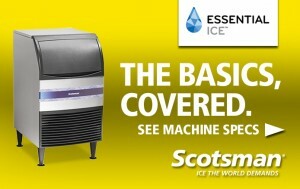 Scotsman Ice Systems has introduced its new Essential line of ice machines. “Our customers asked for a basic, under-100-lb cuber … and we are happy to deliver that need,” said Jeff Biel, Director of Marketing at Scotsman Ice. It’s a great solution for low ice production operations or remote areas within an operation. The Essential Ice Machines are 15″ or 20″ wide, 38″ tall and 24″ deep with 6″ adjustable legs and the ability to fit under 34″ countertops with an optional floor mount kit. The line consists of three different units with daily production rates of up to 58, 80 and 100 pounds. The Essential line is easy to use with its built-in sliding back door to conserve space and allow easy access to the ice bin. The line has an ample access area complete with a large dishwasher-safe scoop to make it easy to reach the ice. Additionally, the Essential line has an intuitive control panel that features a prominent on/off/clean switch and easy-to-see buttons to adjust ice thickness and harvest time. The line is built with an innovative horizontal evaporator that eliminates minerals in ice cubes and ensures quality ice, every time. Essential also comes with a 3-year warranty that assures operators are getting the best ice machine for their operation. Visit Scotsman-Ice.com for more information.